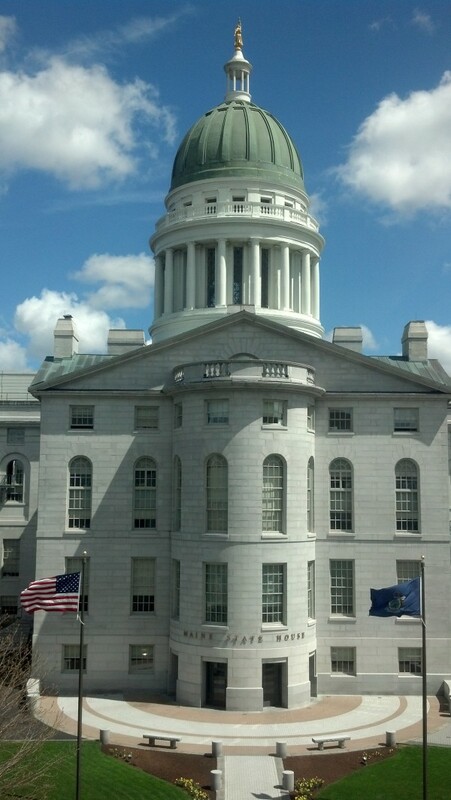 Maine State House, May 8, 2013. AUGUSTA, Maine — The Maine Legislature in 2016 will consider bills aimed at extending stalled conservation bonds and giving priority to in-state companies seeking government contracts after proposals were advanced by legislative leaders on Thursday. The 10-member Legislative Council, evenly split between top Republicans and Democrats, advanced 32 out of 400 bills proposed by legislators for next year’s session, which is supposed to be reserved for “emergency” bills by law. A bill from Rep. Matthew Pouliot, R-Augusta, may be the most high-profile one to get through: It would affect $6.5 million in bonds for the Land for Maine’s Future program authorized by voters in 2010 that are set to expire later this year. They’re among more than $11 million in bonds that Gov. Paul LePage, a Republican, has refused to issue in a bid to increase timber harvesting on state lands to pay for energy upgrades for low-income Mainers. Also advanced was a bill from Sen. Tom Saviello, R-Wilton, that would give preference to in-state companies for state government contracts and purchases if a qualified Maine vendor’s bid is within 5 percent of the lowest bid by an out-of-state vendor with the same qualification. Other bills that moved forward included those that would exempt petroleum products used for fishing, farming or forestry from sales tax, fund court facility projects in Waldo, Oxford and York counties, strengthen human trafficking laws, allow college graduates to claim tax credits on portions of student loans and improve ferry safety. But the council also deadlocked along party lines more than 100 times. When Democrats controlled it in 2013, approximately 100 of 400 bills got through initially. Party-line votes killed Republican bills targeting Planned Parenthood, which has been criticized in recent months by anti-abortion advocates over the use of aborted fetuses for medical research and Democratic bills that would have repealed the LePage administration’s pending rule change re-establishing an asset test for food stamps and prioritizing solar energy projects. Another 18 bills were also tabled by the council, including a proposal from House Speaker Mark Eves, D-North Berwick, that would encourage Mainers to enter the long-term care workforce. Those will be reconsidered by the council in November, when lawmakers whose bills failed can also appeal those decisions. The workload that the council eventually approves will be added to nearly 200 bills that were carried over from last year or have been submitted by state agencies.